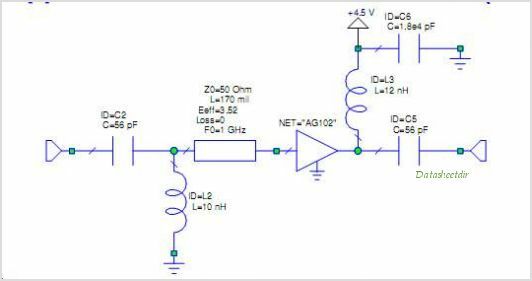 The AG102 is a general-purpose gain block that offers good dynamic range and low noise figure in a low-cost surface-mount package. The combination of near-constant OIP3 and low noise figure performance over frequency makes it attractive for both narrowband and Broadband applications. The device combines dependable performance with superb quality to maintain MTTF values exceeding 1000 years at mounting temperatures of +85 and is available in the environmentally-friendly lead-free/green /RoHS-compliant SOT-89 package. The AG102 uses a high reliability GaAs MMIC technology and only requires DC-blocking and bypass capacitors, and an inductive RF choke for operation. Internal matching provides a 50 ohm input / output impedance minimizing the number of required external components. By WJ Communications, Inc. This is one package pinout of AG102,If you need more pinouts please download AG102's pdf datasheet. 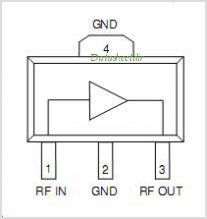 This is one application circuit of AG102,If you need more circuits,please download AG102's pdf datasheet.